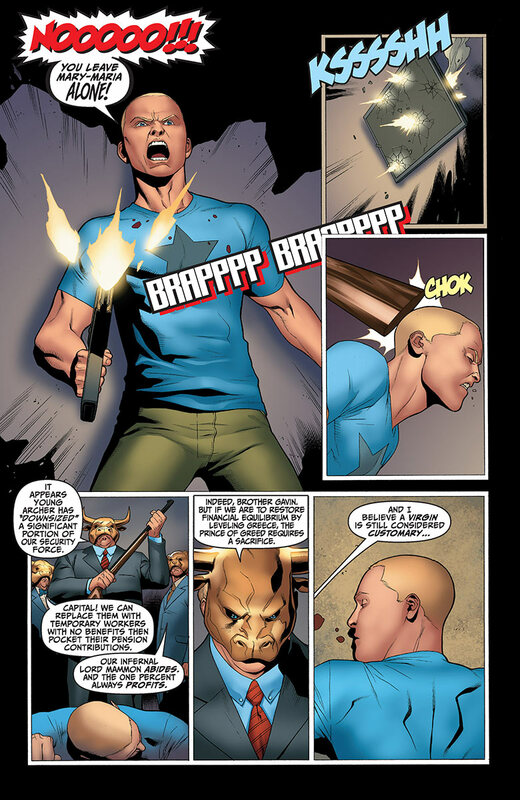 After fate has brought Archer & Armstrong together in a bar brawl to end all bar brawls, Armstrong is captured by the Sect as Archer confronts his parents with the truth about his mission. 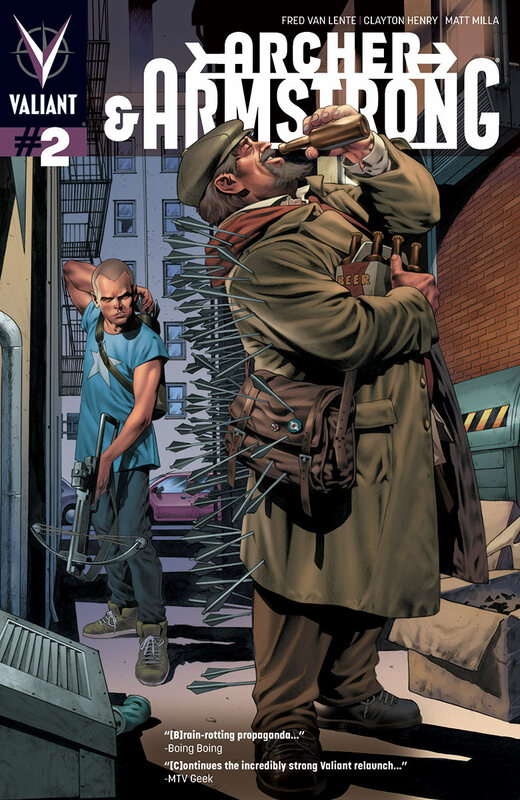 An exciting second issue as Archer & Armstrong are beginning to really feel like a pair of adventuring duos up against a conspiracy that dates a thousand years involving familiar secret societies like the Illuminati & the Freemasons. The story has a National Treasure vibe to it and from what I’ve read, there are pieces of the “Boon” that are sought by both parties, one to destroy the world, the other to prevent it. The pieces are scattered throughout the globe with clues to the whereabouts and possible booby traps added for a little bit of suspense. Archer seems determined to stand up against The Sect and has a change of heart towards Armstrong. He also displays some cool manoeuvres like knife throwing & escapology (love those). We learn more about Armstrong’s past and his encounters with famous historical figures and some impressive displays of his incredible strength. The story isn’t without some moments of humour, mostly between our two protagonists that had me giggling here and there. Writer Fred Van Lente’s story doesn’t waste any time with the plot as the story becomes an Indiana Jones like adventure in a matter of a couple of pages. Clayton Henry’s illustration look great as he draws panels of Archer & Armstrong as two forces of nature with jail breaks, altars of sacrifice & wild fighting scenes. One particular page caught my eye, as our heroes are about to be crushed by a booby trap and Henry cleverly uses the panels to display the moments of claustrophobia. Matt Milla’s colours explode with every panel and makes the characters & the environments burst out of every page. 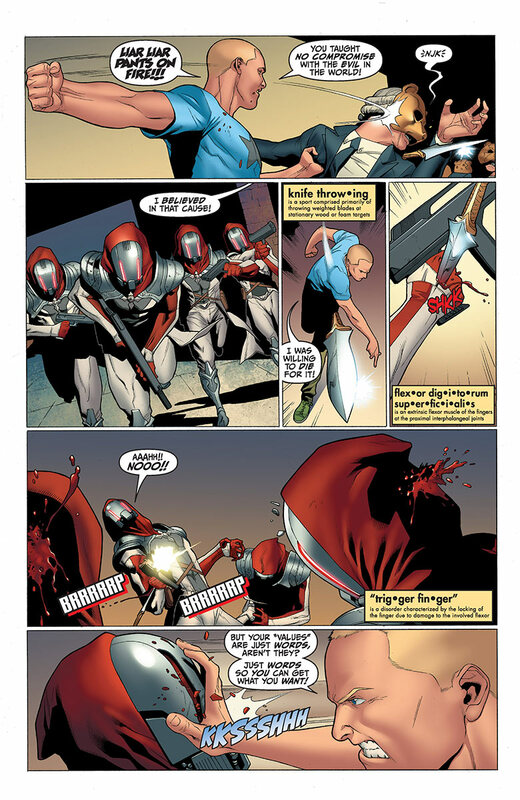 With this second issue I thought the story was a little too quick, especially when Archer & Armstrong travel from the U.S. to Rome in two panels. Armstrong is an immortal who knows a thing or two about the world, but unlike Archer, who’s basically like a child with no possessions probably doesn’t even own a passport. Then again maybe I’m thinking too much. In the end I really enjoyed this comic, the dynamic rapport between Archer & Armstrong is totally there and will probably be there in many, many future issues. This is just a fun series.